I’ve worn my own self out thinking about — and trying to find a way to write about — certain issues which are important to me, but it hasn’t been easy to focus. So, rather than serving up half-baked thoughts, I decided to share a song that took on new importance for me, and for many others, after Hurricanes Katrina, Rita, and Ike. A song that can speak over the roar of natural disasters and the howl of the body politic is a marvel. Mary Gauthier herself is a marvel, and a voice for our time. She knows how to focus, and invites us to do the same. Nicely done. Music can often do a better job of saying what’s in our hearts when we can’t find the right words at the right time. Mary Gauthier didn’t write her first song until she was thirty-five years old, with a very difficult life behind her. She reminds me in some ways of Iris DeMent, whose work I also enjoy. Neither is slick nor polished, but their songs are memorable. Thanks for sharing this “right on time” song. Since I have trouble with hearing perception, I pulled up the lyrics on another location. I left this on so I could read the words while listening to her. Worked very well. I keep learning. I thought about adding the lyrics, and then just didn’t. I’m glad you found them, and could listen along. There were a couple of videos where the words were quite clear, but they were studio recordings with other images added, and I wanted to show her singing. Her performance is so understated — almost diffident — but I think it only adds to the song’s power. Thank you for sharing this amazing song, and very talented lady. You always post things that help bring me back to center, and/or enlighten. I cherish your gifts. Thanks so much for reading, and for those very kind words. There is a calmness in that song that we need right now. It can be hard to walk the line between responsible civic involvement and obsessive anxiety over the state of the nation — particularly when the media have a vested interest in keeping us anxious and obsessed. Ironically, it’s one of Houston’s best talk show hosts who continually advises his listeners to turn off the tv, put down the phone, get off social media, and go do something: even if it’s just going for a walk. I suspect he’d heartily approve of your log project! When I was an investment manager, I often had clients who expressed anxiety fed by watching business “news.” I always told them to turn the tv off. Very smart of you, and very good for your clients. That’s a great example of the same dynamic working itself out in a different context. Isn’t it funny how just turning off the tv/news can be both so easy and so difficult? Yours was the first comment I saw this morning, and it made me laugh, since when you posted it last night, I was already gone, myself. I hope your dreams were sweet, and today is a good one. Happy eclipse viewing! Thank you. We’re heading into Missouri with daughter and her 2 children. We’re having thunderstorms here this morning (and Jim did NOT wake up well to that!) but the weather should be fine where we’re going. :) Have a great day. I’ve just been watching PBS newshour (while I ate lunch) and the current animosity televised is very disturbing. As Terry (Montucky) said, we need some calmness right now. Sometimes I think the people in the streets are the least of it. Certain of our esteemed universities and a few corporations seem to be as intolerant of free speech and differing points of view as any street rioter. And of course once a ball like this gets rolling, no one wants to risk getting rolled over, so strange things begin to happen. There are going to be a lot of statues removed and streets renamed before this finally sputters out — as I expect and hope that it will. But I will not rename my cat. Dixie Rose she is, and Dixie Rose she’ll stay: a good, Southern kitty who understands Southern pride. Compared to the stresses that most endured during WWII, this week seems rather pedestrian. In terms of scale and duration, of course WWII was far worse. Still, there are differences worth noting. In WWII, the nation was essentially united against external enemies. Now? We’ve had years of deepening internal divides, and the corrosive effects of low-level violence and continual conflict are undeniable. We’re fighting one another, in a multitude of ways, and have been for more than a week. It’s also true that most of the country isn’t directly affected by riots in the streets, but amplified rage, irrational fear, and impulsive acting out are becoming more common. Just tonight, six more police officers were shot and [either one or two — reports aren’t clear] of those six died in Kissimmee, Florida. If that’s pedestrian, I think I’ll pass on the excitement. I did not hear about the brutal shooting of the police officers and am very sorry to learn of this. Obama hatched Trump. and Bush hatched Obama. We’ve had enough egg heads as presidents for 17 years. And Americans are not critical thinkers. Many are uniformed dolts, angry about their own circumstances, lazy beyond lazy. Where are we headed? I went to yoga yesterday and listened to a plea for compassion and Namaste. Although I, too, wish for this type of response by our multi-cultural non-melting pot, I would defer to Machiavelli. I’m currently working my way through The Death of Expertise, an excellent book that suffers primarily from a problem inherent in any good overview: you always want more. Nonetheless, Nichols’s levelheaded approach to a wide range of issues, from nuclear first strike capabilities to social dislocation, has made him one of my must-read authors. In “The Revenge of the Lost Boys,” he makes a strong case that supports what you say about the uniformed dolts with their ahistorical ranting and general laziness. Interesting that you mention Machiavelli. I’ve been pondering Savonarola myself, whom Machiaevelli followed in real time. When I heard that the Six Flags Over Texas amusement park was taking down every flag other than the American flag in order to avoid giving offense, I couldn’t help thinking of the bonfire of the vanities, 1497-style. Since 1961, Six Flags has displayed flags of each of the countries which ruled Texas at some point: Spain, France, Mexico, the Republic of Texas, the Confederate States of America, and the United States. In other news, Presidio La Bahia in Goliad, that shrine of Texas independence, has no plans to remove their set of flags. Excellent book, The Death of Expertise. I think I read its review in the WSJ last year and ordered it. It nails the point that we have so many self-proscribed and self-deluded “experts” on everything from vascular surgery to gut health, from Mexican-American history to the Balfour Agreement, from olive orchard management to pesticide poisoning. Many professional organizers and their blind followers are crazy. On a completely different note (other than the word “crazy” made me think of this….we are heading up to southern Idaho next month for a road trip. One of the places we are staying is Orofino. A friend married a woman from that area and told us that there is a mental hospital in Orofino. The local high school’s mascot is “The Maniacs.” Can you see that happening in California? One of our local high schools was founded in 1964 and took the mascot The Warriors, which were Lakota Sioux. The student newspaper was the Smoke Signal, the yearbook was named after a local tribe, The Costanoans. She led a campaign to abolish the Lakota Sioux mascot and she won. She ultimately moved on to another school. We became the “Peaks” for a time to commemorate Mission Peak. But…the two peaks on the front of the tee-shirts looked suggestive, so the school went back to the Warriors, with no icon at all. Sorry for all of my singular parentheses and generally sloppy writing with no transitions but I was on a roll…. Finally~! Now there’s nothing to do but give thanks the power’s still on, make coffee, and get caught up here on the Glorious Communication Machine. It’s been an exhausting time since Wednesday, trying to finish up some varnish, get some boats secured, and generally preparing for this beast. But the varnish got almost finished, the boats are secure, and I’m prepared. I decided to forego evacuation, since the only real threat I expect to experience is power loss. Flooding rain and storm surge aren’t issues for me, and I’m in a building that made it through Ike with only some shingle loss on the roof. So, that’s all good. The tornadoes are a crap shoot, so I don’t worry myself about them. Speaking of experts, one of the things that I’ve found helpful in situations like this is Twitter. The true experts in all things weather-related (the head of the flood district, the various meteorologists at the NWS, various skilled amateurs and storm chasers) all use Twitter to update, and it’s an easy way to get information without the breathless and sometimes fear-mongering hype of the tv and radio sorts. I laughed at Orofino, because it reminded me of the name for the new Google Android Oreo operating system. In this time of renaming everything that might be offensive, did not one tell them that Oreo’s more than the name of a cookie? Perhaps they know, but didn’t care. That might be a step in the right direction. As for the Maniacs, that brought to mind one of my favorite films, and a pretty good song for a nasty morning. Thank you for this update which made me feel a lot better. My niece, who is in her last year of medical school and heading toward dermatology, is supposed to fly into Houston tomorrow for her 1-month stint at University of Texas, Houston. Which airport is your niece flying into? And where is she going? I presume the Medical Center. There have been several ground stops over the past couple of days, and flights held at their point of origin. I hope she doesn’t run into serious difficulty. Getting here may be the easier part of it, since Houston freeways flood in a good thunderstorm. One of the best, hype-free forecast site is Space City Weather, and both of its mets can be followed on Twitter: @SpaceCityWX and @mattlanza. I’ve depended on them through this, and they haven’t been wrong yet. Thinking of you as the hurricane approaches the Texas gulf. Please stay safe. I’m well prepared. I have Talenti blackberry gelato. If the power goes off, I’ll find a spoon and console myself. Then there’s this: https://en.wikipedia.org/wiki/Lost_Cause_of_the_Confederacy which is very cogent for Wikipedia. Whales can do it. We’re supposed to be the one with all the brains, so why can’t we? You don’t soon forget a handle like juliusgoat. I came across his twitter feed when I saw the captioned photo online, and my immediate response was, “Exactly.” You’ve been in places where oppression was real, and so have I. I suspect most young men in that photo haven’t had that experience. The issue of what the Civil War was about has been front and center again, and that can be good. One of the people whose scholarship I admire pointed out that more study of the Confederacy over the years might have avoided at least some of today’s ahistorical blathering. The same is true with the KKK. They didn’t emerge, fully formed, in the 1940s, and start lynching people. I found the photo I used here when I was researching the Klan in Iowa in the 1920s. In that place and time, it was mostly about Catholics and immigrants, although they were more than willing to disparage and threaten blacks and Jews, too. As for why some people are able to experience empathy and others seem less responsive, it certainly is complicated. Your mention of the brain points to one aspect of the issue: the relationship of knowledge and will. People know the health effects of smoking, but some choose to continue the practice anyway, and refuse to change, no matter how many facts are presented to them. In the same way, some people choose to see certain groups as less than human, and resist information that contradicts that chosen view. It’s more complicated than that, of course, but I’ve seen a lot of bad choices recently. Never heard of Mary G. But she is quite talented and the song is beautiful. You might say she is not polished but I don’t think there is one thing wrong with her singing/presentation. The violin accompaniment is perfect. I like the way you addressed what I consider to be a massive problem of our nation. It has been and remains a huge worry for me. If things don’t get better, I fear for our nation. Our country will not and can not function as united, unless things change for the better There is no place for division or supremacy. Since Mary Gauthier’s new to you, you might enjoy this article, which packs in a lot of biographical detail, along with her interesting responses to interview questions. I put a link to this post on Twitter, and was surprised this morning to find that she’d stopped by and “liked” it. It pleases me to know that she knows her own favorite song is popping up in hidden corners of the internet. It seems to me that identity politics is part of the problem. So is the anxiety that arises when we find the rest of the world doesn’t see things exactly as we do. If I believe X, and you believe Y, one approach would be to say, “Well, let’s see if X and Y have something in common, and let’s explore their differences.” Another approach is to say, “You believe Y? You’re mean, evil, and nasty, and I’m going to try and destroy you.” A little more of the first approach could help us out. I like X&Y. That’s how it should be done but folks are short on patience and don’t want to compromise. I’ll check out Mary G. a bit more. I didn’t know that you do Twitter. Never have used it. Just does not appeal to me. But it’s great for some folks. Twitter’s been useful for me. I don’t engage in the bickering and worse that goes on there. Instead, I tweet out announcements of new blogs posts, or occasional questions to people I follow. But it’s a great way to find articles and observations I’d otherwise miss. By reading broadly across disciplines, and generally avoiding the repetitious and hyped-up media, I manage to stay informed while keeping my blood pressure down. 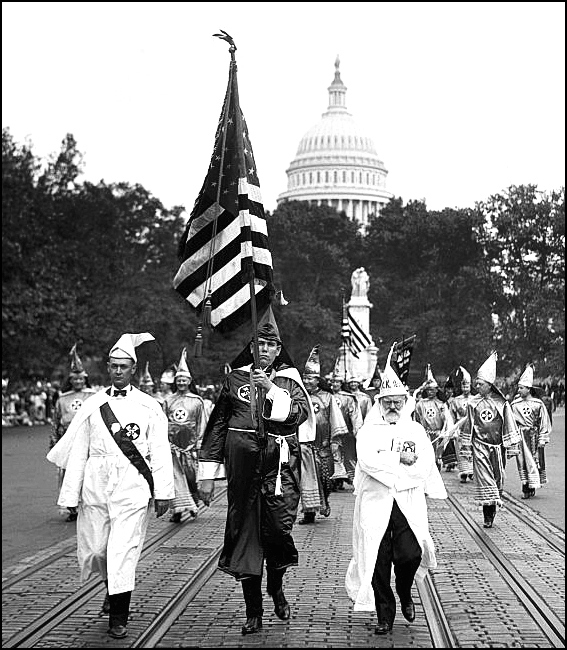 The picture of the Ku Klux Klan sends shivers down my spine. All that simmering hate and still now, so close to the surface, and after all those years! Slavery was accepted because the practitioners were devout Christians. Was it Marlene Dietrich who sang, ‘when will we ever learn? Listening to this music and the singing by Mary Gauthier is so timely. We need more art and less division. I have to disagree that slavery was accepted “because” the practitioners were Christian, although I’ll certainly allow that there are faithful Christians and Christians who wander pretty far afield from traditional teaching. While some used the faith to justify slavery, Christianity also played a role in ending slavery in this country: at least partly, and somewhat ironically, after Christian teaching began to take root in slave communities. Beyond that, the history of slavery in other parts of the world, was (and is) just as appalling. In West Africa, where Islam and tribal religions are important belief systems, slavery is just as real. This article that references the research of an Australian group is especially enlightening. The importance of music is especially worth highlighting. Songs of the Underground Railroad, like “Wade in the Water” are good examples of the way Biblical imagery became embedded in struggles against an obviously non-Biblical way of life. For a very basic idea – no matter the language or the wording – to treat others as we would wish to be treated is the same around the world; but when religion gets twisted to suit, bad things happen. And when a professed atheism gets twisted to suit, bad things can happen. The irony, of course, is that many who claim atheism have their own gods, and their own ways of worshipping. Some of those lesser gods are easy to spot: money, power, prestige. Of course it’s possible to worship ourselves, too, and in this era of obsessive self-regard, that one’s growing in popularity. Part of the trade in American slavery, but not the only one, was the conversion of slaves into western Christianity which seemed to deliberately ignore and override the pre-existing spirituality of the black people. I found this link very informative. That’s a good article. One of its values is that it describes so clearly the constantly changing relationships among blacks, whites, freedmen, slaves, institutional churches, and the faithful at large. We didn’t have any black congregations in town when I was growing up, since there was only one black family that I remember. I think the closest probably were in Des Moines. I did often play with a friend who lived across the street and whose house had been a station on the underground railroad. From what I can tell, that house is gone now, but this one, also a part of the railroad, was on the way to my grandparents’ house — if we took the “long way” to sightsee. Your country certainly has experienced more than its share of turmoil over the past months, and the direct threats to citizens are more widespread than anything we’re contending with. Will the prayer be answered? It has been in the past. I trust it will be in the future. That, of course, is a faith statement, but as Pascal put it, Le coeur a ses raisons, que la raison ne connaît point. Much trouble is caused, however, when we allow the heart to rule the head, when we judge others and, indeed, when we seek to fathom the inscrutable workings of Providence. This lovely song recognises the entire dilemma. There also can be trouble when we attempt to substitute head for heart. Despite it’s length, this video that builds on the work of Jonathan Haidt and Daniel Kahneman (and a few other old fogey philosophers) is a lucid introduction to the relationship of reason and emotion in the art of persuasion. I wasn’t sure about the inclusion of Mr. Rogers, but it made sense at the end. Thank you for the link. My browser isn’t allowing me to access it for the present. I’ll try again later. In the meantime, I venture to refer to the work of CG Jung. Not content with dividing the functions of the mind into emotion and intellect, he allowed for sensation, emotion, reason and feeling (or intuition) in order from the most primitive to the highest. Reason, he argued, has no creative function or driving force, and relies upon feeling or intuition to provide the necessary material to work on. Reason, though, provides the filter to dispense with imperfect or outlandish ideas. Great mathematicians undoubtedly experience this principle in operation. The historical course of mathematics itself testifies to it. Jung also spoke of “layers of culture” rather than race. It is unfortunate that some seek to remove statues or other physical evidence of our progress. These markers contain lessons and reminders for us all and the desire to obliterate them has an uncomfortable correlation with the urge to burn books. The video I linked promotes reason as the shaper and clarifier of our intuitions and experience, but makes the further point that persuasion with logic alone rarely is successful. As for the current hysteria over names and symbols, it won’t end until people stand up to it. I was amused and astonished this morning when I read that the name of the USC Trojan mascot, a beautiful white horse name Traveler, is the subject of discussions centered around changing its name, because it bears the name of Robert E. Lee’s horse. I await Cheri’s opinion with anticipation. Yesterday I swore in this comment section that I never would change the name of my cat, Miss Dixie Rose. At the time, I was joking. Now, I fear animals may not be immune to demands for ideological purity in their naming. Of course, that leaves me with another problem. My middle name is “Lee.” The fact that my relatives fought for the Union may not be enough to save me. I don’t think I’ll persuade my son-in-law to change his first name whether by proposition, syllogism or otherwise. It is doubtful whether, strictly, you can change a Christian name under the Common Law, though many do. “Traveller” is the correct spelling. I’m sorry – my facetious comment misfired. “Traveller” is how we write the word in England. We do make heavy weather of things, as we do in all our manoeuvres. Safari eventually yielded the rhetoric video, which was a joy to watch, although I “felt” the senator had already been persuaded. I laughed at our misunderstanding over the spelling of Traveler/Traveller for a reason you couldn’t have suspected. I don’t have many spelling difficulties, but one I do struggle with is a propensity to double consonants when they shouldn’t be doubled, or use only one when there should be two. Renovate becomes rennovate, and so on. I’m getting better at spotting my own errors, but they still pop up — so if you ever see one, feel free to let me know. Cheri may remember a “sonnet” I offered once called “Do Not Villify” that spelt out “thecriticalline” diagonally, the name of one of my blogs. Thereby hangs a very long tale (or is it tail?). Note there are 15 letters for a 14-line sonnet, although my blog was spelt with a single ‘l’. I have suffered many excruciating embarrassments on the web. I just hope they went largely unnoticed. Another browser allowed me only three minutes of a 24-minute discussion. Those three minutes seemed to draw on Jung. You may enjoy this debate: the House of Commons at its best. I did enjoy that. I also noted that many of the persuasive techniques recommended in the video I linked were being practiced, and with some skill. And yet neither Rory Stewart nor Jacob Rees-Mogg succeeded in persuading the other! Huh? “… wildly attracted…”, eh? Remember, I know your penchant for irony. Very poetic, thought-provoking lyrics — especially in these difficult times which seem unlikely to end any time soon. Would that we not be led to repeat the history of another nation I recall from my youth. Indeed. I’ve thought recently while following events that it’s rather like waiting for a fever to break. What we don’t yet know is whether the underlying health of the body politic will be able to fend off the infection. That link provides another historical angle to consider when we reflect on parallels we see in our culture today. Certainly does give food for thought given the reported attitudes of the young artists independent of government, at least initially. Thanks, Derrick. Making thoughtful choices is important. I wish there were more thought going into choices these days. Mercy now would be a very good idea, as well as some calm, cool heads. As for statues, particularly of prominent, powerful people. I think there is something in them, or what they stand for, which makes them prone to fall or be shoved. Statues aside, I do hope the civic waters settle. The history of toppled statues is interesting. Lenin, Stalin, Cecil Rhodes, Hussein, Columbus and a good many others have come toppling down: sometimes in celebration, sometimes as propaganda, and sometimes just because it seemed like the thing to do at the time. The most amusing suggestion I’ve heard is a local one. You probably have heard of Houston’s Astrodome. It was the first covered dome stadium in the country, and was used for various events — sports and otherwise — for years. But now there’s a new stadium, the Astrodome is a crumbling wreck that’s been condemned by the health department, and most of Houston would like to get rid of it. But it’s a symbol of the city’s glory days, and various city officials want to repurpose it, though heaven knows how. In any event, the suggestion was to declare it a sacred and immutable monument to the Confederacy. With enough publicity, the citizenry might become even more demanding, and the County officials confused enough to rule in their favor. Problem solved! Somehow, I’d imagined that work was progressing on the Cathedral, and that in the near if undefined future you’d be showing us photos of its glorious re-opening. Perhaps not. I did enjoy the piece on One Tree Hill. The natural and the human history are both quite interesting. On the other hand, two little details that made me smile are quite recent. There was this — “The hilltop is always accessible by foot but because it became a nightly party stop for boy racers and other (often drunk) groups of youths, after-dark road access to the summit was closed in 2008” — and also the mention of the chainsaw used in cutting down the last tree being offered up on eBay. What a world. Isn’t perspective one of the gifts of aging? Some societies certainly believe that to be the case, and consequently honor their elders and seek their counsel. It occurs to me that we seem even to have lost the phrase “elder statesman.” Well, except for the luxury store in Los Angeles, where you can buy a nice blanket for as low as $2,100. Of course if you want a really nice one, you can up that price a bit. Who in the world buys a $6,000 blanket? We have a TV show here, aimed at under 16’s, with the title “Why don’t you…” persuading them to do just that. Personally, I believe media outlets have a lot to answer, for state of the unrest in the world. I agree with you, Sandi. In this new world of clicks, likes, and page views, a primary media goal is getting us to open their pages, and the best way to do that is to sensationalize the news. Tabloid journalism’s gone mainstream, and screaming headlines about the latest health scare, impending financial collapse,or celebrity scandal crowd out other, more important news stories. Beyond that, if social media users can foment conflict and arguments, they’ll get more likes, retweets, and page views, and it’s amazing how many people judge their own worth by that kind of standard. Good for your television programmers. Any encouragement for kids (and adults) to become participants rather than observers, and active rather than passive, is commendable. Given your photographic interests, you might appreciate this interesting article, which has less to do with selfies than with a changing — and much more passive — understanding of photography. I wasn’t aware you could use a camera in the National Gallery. Many museums I have been in lately do not let you take photos. All I can say is that we have come a long way in 50 years. On my first visit to the National Gallery, I spent over an hour sketching ‘The Haywain’ by John Constable, which made me look really closely at it. If I had taken a ten second ‘snap’, I doubt I would still be able to see it in my ‘mind’s eye’ half a century later! What you say about the power of sketching vs. the quick snap is so true. There’s research beginning to appear now that supports the power of hand-writing notes as an aid to memorization. One of the Justices of the Texas Supreme Court recently advised first year law students that one of the best ways to begin their studies was always to take notes by hand, and there are a few schools no longer allowing electronic note-taking in the classroom. It’s rather like cycles in women’s clothing, isn’t it? Let that dress hang in the closet long enough, and eventually it will become fashionable again. It’s been exhausting and disturbing. Sometimes it’s better to be quiet and float away on something soothing like a song. While I haven’t yet screamed, “A pox on all your houses!” I have cut back on my news consumption. Isn’t that an interesting phrase? When did we become “consumers of news”? If we’re consumers, there has to be a seller, and there seems to be no shortage of people trying to sell us their point of view. The so-called news has come to resemble the soap operas my mother used to watch. I learned pretty quickly that if you missed a day, or a week, or even more, it didn’t make any difference. When you tuned back in, things were essentially where they’d been when you left. Our government has resembled a soap opera for years. There appears to be a plot, but nothing seems to change. A song, a book, and a breeze aren’t the worst remedies just now. With 57 different war-like conflicts going on in this world and the toll that natural disasters take – you’d think people could pick priorities in their lives and try to make it a better place, not a more violent place to be. Of course, if I may say so — with tongue just slightly in cheek — it’s also true that some people have as their priority making the world a more violent and unwelcoming place. I suppose none of us likes to acknowledge the evil in the world, but without facing it, it can’t be defeated. Story after story from the Pacific theater makes that clear — as do so many other sad examples from history. Still, goodness does exist, along with the desire for peaceful, productive lives. Learning how to nurture our better natures may be one of the best ways to defend against those who would tear our communities and countries apart. It is beautiful, isn’t it? Even in the midst of so much chaos, there are grace notes. By the way, I thought you’d enjoy knowing this. Justice Don Willett, a member of the Texas Supreme Court, was asked what advice he’d give first year law students. He listed a few things, including an admonition to always take notes by hand, in cursive. There have been an increasing number of studies suggesting that we’re better at remember things we write by hand, and His Honor agrees. Carry on! Thanks, we all needed that. You’re welcome. A little breathing room is good for body and soul. Every week brings new conflict and turmoil. Those divisive and hateful parts of human nature are getting too much attention. It leaves me at a loss for words. Only one comes to mind with your post. Thanks, Jim. What you say about the attention being paid to the divisive and hateful is important. It’s clearly a way of distracting from other, more pressing issues. What to do? Perhaps rebuilding the center is part of the answer. How to do that’s the question, and I certainly don’t know. But a first step might be an increased willingness to accept that different people believe different things. After all, if I prefer vanilla and you’re a fan of chocolate, we still can build a banana split without either of us having to give up our favorite. Amen to that. Yes, different people believe different things. We need to talk with each other more and share those thoughts and beliefs. When we do that, we realize we aren’t really that different in our core. I think this country needed mercy when the Native Americans woke up one day to see white men on the horizon. And it’s all gone downhill mercy-wise since then. Those with the most power are obligated to show mercy. I’d say both stereotypes — the rampaging white man and the innocent Indian — are at the same time true, and not true. Not every explorer or settler was evil personified, and tribal warfare was a reality long before the dislocations of tribal life by Europeans took place. That Shakespeare really had a way with words. Yes, that play is one of my long time favorites. I suppose I could have said “Bad white men”, but I assume most of us know some US history about how natives were treated specifically by white men- those bad white men who did bad things to natives. And of course there were fierce natives. They were also fierce among themselves and against other tribes. That’s their business, not the business of the Anglo world. I don’t know of any Indian tribes that ended up sitting pretty after we got done “dealing” with them. And we still demonize them. I had a friend who said that she thought Mexicans were “beautiful, gentle people”. She lives in AZ. I think she’s nuts. They aren’t “beautiful, gentle people”. They are just like white folks: Gentle, beautiful, stupid, smart, and cruel. That’s equality. Human beings are all those things. Your last paragraph’s exactly right. If we could adapt that insight for our political discussions, we’d be much better off. Not every Democrat is a demon, not every Republican is a rube: etc., etc. Your comments about the Indian tribes raise an interesting thought. One reason the tribes were easier to control or defeat was their very nature as tribes: smaller groups, disconnected from one another, competing for resources, and so on. There’s clearly an attempt being made in this country to set citizens against one another, to separate us from one another, and to inflame tribal-like warfare. As identity groups become smaller, more fragmented and more suspicious, we’ll become easier to control, too. It’s worth thinking about, so thanks for raising those thoughts. The song you selected is very timely. Ben wrote a post about the current situation, that you might find interesting, which sums up where we are and what’s going on..
Ben’s post certainly is comprehensive, and I noted the attention paid to the use of distractions as a tool of control. I don’t think anyone doubts that the technique is being used at this point: or at least, very few. And it’s an equal opportunity tool. I’m no longer sure how many sides there are in this country — more than there used to be, I suspect — but everyone is being tempted to ratchet up their attacks. Even children are smart enough to stop playing a game when it isn’t fun any more. Either some of our adult game-players aren’t very smart, or they’re getting more enjoyment from the chaos than I can fathom. Amen! Mercy certainly seems to be in short supply these days… I’m off to check out more of her work! Certainly would be nice to have a flash back or a jump forward: Live and let live; Agree to disagree and still be friends. Did you happen to see the recent Harper’s Bazaar article titled “If You Are Married to A Trump Supporter, Divorce Them”? When I came across that, I decided we’d reached peak insanity. Like the pet owners who refuse to vaccinate their dogs against rabies because they fear autism, some things defy explanation. At least the eclipse will eclipse our eclipsed politicians in the news cycle for a day. Hmm, if the rise in autism is indeed a byproduct of vaccination, somehow I don’t think it’s the one for rabies. The commenters above unanimously call for peace and calm. On any of the specific issues that you hinted at, however, I can’t help but think that one large portion of those commenters would be at the throats of another portion. Most of the people who gravitate to something, in this case your blog, probably assume that everyone else who comes here feels the same way they do about everything. If only they knew…. I’m not so sure about that. Readers here certainly do range across the political spectrum, but that’s not the end of it. There are representatives of multiple faith traditions; beef farmers and vegans; pro-and-anti-Brexit partisans; serious environmentalists and at least one person who still uses Weed-n-Feed. I know that some are aware of the opposing views of other commenters, and a few know how substantially my views differ from their own. Now and then, there’s even a good-natured poke at my midwestern conservatism, but anyone who’s paying attention can spot that. Sadly, both my most ultra-conservative reader (NumberWise, an upstate New Yorker) and the most radical leftist (EllaElla, essentially a Manhattanite) both have died, but while they were alive neither was particularly reticent, and they delighted in making oblique references to each other’s comments. In trying to think through what might be the downside of someone assuming they were part of a homogeneous group of readers, it occurred to me that a more serious issue might be readers assuming my views were identical to their own. If I were shaping posts in order to keep readers from being at my throat, or if I were engaging in the always-useless attempt to be all things to all people, that would be worth some thought. As it is, I’ve managed to stick with my “I’ll write what I want, and whoever shows up is welcome” philosophy, and it’s worked pretty well. If it hadn’t, blogging would have become wearisome, and I probably wouldn’t still be here. That’s not to say there’s not still more to learn, particularly about dealing with sensitive topics. I follow Jonathan Haidt on Twitter, and when he recommended this video, it was just what I needed. Think of this post as first in a (non-consecutive) series. The grand-daughter of a friend recently graduated from St. Theresa’s Academy in a suburb of Houston. It’s what’s known as a classical school. Both the curriculum and her level of achievement would put a high percentage of current university students to shame, and her critical thinking skills are top-notch. In the linked article, the caption under the last photo at the top quotes another classical school principal, Mary Pat Donoghue, as saying, “We’re equipping young hearts and minds to save civilization itself.” She just might be right. I didn’t listen to the song. this country and world could use a little mercy but I think mercy and human beings is a rare connection. even with our history of racism I never thought that this nation would inherit the soul of Nazi Germany. now is the time to resist, not later when they have taken over. I’m sorry you didn’t listen to the song. I think it might be different than you imagine. There certainly isn’t anything saccharine about it; Mary Gauthier’s history probably wouldn’t allow for that. I understand your concerns about Nazism, but personally I wouldn’t say that our country has — or will — inherit the soul of Nazi Germany. The events in Boston today were interesting in that regard. The so-called “free speech protesters” numbered a hundred: the number allowed by their permit. The counter protest? I’m sure you already know that they were estimated at 15,000. Of course I don’t know what will happen, but I have a hunch that some of this will fade away over the months. From the little I’ve read, it seems that movements like this — and the KKK — ebb and surge, depending on circumstances. And of course, resistance by the society at large can help to contain them: exactly your point. You know Linda, I had the exact same thought back at the beginning of the week… And it slipped away on Tuesday. I am glad you reminded me of my original impulse. I’m glad I did, too, because it’s a good impulse. No one can live in a state of constant frenzy, or frustration, or anger. We joke about it being bad for our blood pressure, but in truth, it’s entirely capable of breaking down our bodies as well as our spirits, and who wants that? In other news, have you heard that Peter Conaty passed away? The memorial service will be at the church in West Columbia on Sunday the 27th at 9:00 AM, and an open prairie day at Nash to celebrate his life will be on September 3rd, starting at 11:00 am. The last time I saw him, he and Susan had come to a meeting of the Clear Lake chapter of the Native Plant Society. That may have been two or even three months ago. I’m just so sad. He was a wonderful man. I had spotted Susan’s notice on Facebook. He was exactly what he was, a good man, the world has way too few like him…. Beautiful. They always say music soothes the savage beast. It soothes me, that’s for sure. I’m not particularly savage, but I can be beastly from time to time, and it always feels good to let it go. Even where the government is concerned, Varnish John’s advice is spot on: do what you can do, and not what you can’t do. What a difference the dropping of an r makes. What a difference, indeed. It’s interesting how firmly embedded a misquotation can become. I started hearing about that “savage beast” when I still was in grade school. But for sheer misattribution, there’s nothing that beats the transformation of Congreve’s “Don’t go to bed angry, stay up and fight” into “Don’t go to bed mad. Stay up and fight.” All around the internet, that reworking is attributed to Phyllis Diller. I wonder whether Congreve ever wrote that. It sounds modern, like something Phyllis Diller would have said. I’ve only been able to find one attribution of the sentiment to Congreve, and it doesn’t mention the specific piece by Congreve in which the statement supposedly appeared. Have you been able to locate a source? It does sound modern, and despite more searching I couldn’t find a better source. What I did find was yet another variant: “Don’t go to bed angry; stay up and plot your revenge.” That’s been attributed to Bill Murray and Maxine, among others. I sent all the variants off to the Quote Investigator. He has only one reference to Congreve on his site, so he might be interested in pursuing it. That mention of Congreve, by the way, comes in the midst of a post about punning, and involves a visit to a tavern by Daniel Purcell and Congreve. Have passed this right on to others! Thank you so much. I see a variety of perspectives represented in the comments here, and what’s notable is the civilized nature of the discussion, for which you must be credited in both the tone you set and the thoughtful way you respond. The guiding light for me in trying to be helpful where I live (not an easy place to do it, BTW), is Theda Skocpol. A strong focus of her research is civic engagement, which she’s studied intelligently and written about lucidly for years. Here’s the briefest possible summation of what she concludes: “a strong civil society really comes from simple things like convening conversations over food, reading and study groups, encouraging involvement in various civic activities, community meetings, interfaith dialogues, and coalition-building.” In other words, change happens face-to-face, in exchanges where folks at least try to listen and treat one another with respect. Here’s a terrific video demonstrating how one community bridged what at first seemed an insurmountable divide: https://youtu.be/t33Hy4XSymg Mark Sharpe, in the video, embodies just one poignant example of the possibility of change for the better in the internal journey he took. Indeed it could. Back in an earlier incarnation, my “bible” was a little book called “Getting to Yes.” The main takeaway for me was the need to get away from “position bargaining,” that is, to get past taking positions to examining the underlying interests that are at their root. The video of Christians and Muslims coming together reminded me of another interfaith effort: the joining of Christian and Muslim women in Liberia to bring down the dictatorship of Charles Taylor and end the civil war. You may have seen the film about the events, titled Pray The Devil Back To Hell. It’s extraordinary, and available to rent at Amazon, but this clip shows the beginning of the movement, and this one is a smiling look at the Liberian Lysistratas. I’m curious whether Skocpol has written about the effects of social media on society. Articles about the Millennial generation are pointing to increasing isolation and rising anxiety levels. Telecommuting is reducing time in the office, and even in restaurants, families who ostensibly are sharing a meal stare at their phones rather than looking at each other. Is technology lowering the amount of face-to-face contact? If so, how can that loss be compensated for? Another article you might be interested in is an old one (2008) by Paul Graham on how to disagree. The meat of the article’s been put into this helpful diagram. I was not aware of the film and am very glad to learn of it. The clips alone are beyond price. The Graham article and related diagram are excellent as well. Skocpol’s studies are wide-ranging, though she hasn’t, to my knowledge, studied the impact of social media specifically. I’d be very surprised if technology isn’t lowering the amount of face-to-face contact, and I share the view that this is a problem that needs to be addressed. On a related note, one of the things I’ve been involved in recently where I live is “neighbor-to-neighbor” canvassing, the object of which is to knock on doors and engage community members in conversation about their concerns and interests. The response we’ve received so far has been remarkable. Based on my own experience and those who canvassed with me, we need to do a lot more of this everywhere as a beginning step to rebuilding community. I can’t recommend the film highly enough. I have a very slight personal connection, since a woman with whom I worked in Liberia took part in the protests, but the awards won both by the film (Tribeca 2008, for one) and by Leymah Gbowee, Ellen Johnson Sirleaf, and Tawakkul Karman (2011 Nobel Prize for Peace) testify to the importance of the work they did — and continue to do. When I read your sentence “Have passed this right on to others!” I took right as a noun and wondered which right you’d transferred to other people. Your statement is an excellent example of how the same string of words can mask different underlying syntactical structures. That’s a fun observation. I never would have read the sentence in that way, had you not pointed out the possibility of a different meaning. And think of how, in our lifetime, the noun fun has also come to function as an adjective. The earliest example I found was from 1966. That’s earlier than I expected. It’s nice to have you around again, Curt. I know where you’ll be next weekend — or at least you’ll be on your way. Is your bag packed? We do need courage in our leaders, but we need to encourage ordinary citizens to become more courageous, too. All of us need to hold leaders to greater account, to think for ourselves, to express our opinions, and refuse to be intimidated by the equivalent of schoolyard bullies. It’s not always easy, but it can be done. As for a willingness to compromise, it bothers me that “compromise” too often means little more than one side silencing and overcoming the other. That kind of compromise rarely holds. We need to stop talking over one another, yelling when someone disagrees, and considering violent and obscene language to be a substitute for rational arguments. I suppose that’s unbearably old-fashioned, but there it is. Calm, sane decision-making sounds pretty good right now. And honestly? At this point, just an end to insane behavior sounds pretty good. Thinking back to my days in Poly Sci 1, Linda. Boy that was a while ago! But I remember the statement (still) that politics is the art of compromise. Much of what I did during my work life was organize coalitions of diverse groups to solve common problems. It’s hard, but it can be done. Anyway, I agree on the courage. We can’t let the bullies and haters win. We can’t let them intimidate us. Bad things lie down that road. I wouldn’t quibble about politics as the art of compromise at all. What I had in mind was more in the line of compromise of personal values for political expediency. I think those are separate issues. If you haven’t read Susan’s comment, right above yours, I think you’ll be interested. I hadn’t heard of the woman whose work she referenced, but it sounds solid and useful. Agreed, Linda. Making a decision for the better good of the whole is certainly different than making a decision because it is expedient. It is one of those songs, isn’t it? I listened to it several times last night; it’s one that seeps into your bones. And it’s true that this, too, shall pass. An advantage of getting older is the development of perspective. When I think of the things I’ve seen that today’s young ones couldn’t imagine, it’s astonishing. When I go one step back and think about the things my mother and her generation experienced, it’s even more remarkable. As for my grandparents — that might as well have been the Pleistocene. Quite a wonderful song, Dina. I’ve never heard it. I poked around a bit and found it came out in 1992, but didn’t get much play here in the U.S. There wasn’t any Pandora or Spotify or iTunes back then, so a lot of good music went unheard. Thanks so much for adding it. I’m going to find the album and listen to the whole thing. Your link wouldn’t play for me, so I went and got this one; ) https://youtu.be/NJnwUbJoheo. But thanks. Have loved Buffy for a very long time (grade nine English class poetry assignment; ) she’s a national treasure. Sorry about that. The linked song’s “The Big Ones Get Away” — and isn’t that the truth? Canada’s the home of many of my favorite singer/songwriters, but Buffy Sainte Marie’s never been a favorite. In fact, I know very little of her music. When I looked at her biography just now, I saw some reasons for that, including the fact that, as she began to increase in popularity in the U.S., I was in Liberia. By the time I came home to California, other music was popular. Better late than never certainly applies, though. I also appreciated your cogent commentary in reply to comments. Because we are traveling my access to news or media is through the phone. So I don’t get screaming headlines unless I go to a web site for news. That fact, however, does not protect me from the reality of what is tearing our country to shreds. On an even darker note I read today that NASA scientists are thinking of drilling a hole in the base of the Yellowstone volcano to relieve pressure. Some scientists say that could cause a catastrophic eruption that would cause nuclear winter for the entire earth. How’s that for some perspective. I do believe we’ll get through this, as we have all the other insanity our country seems to produce. History says we will. Thanks again for another great post. What is your twitter address? I’m on Twitter @varnishgal, but rarely post there. When I remember, I tweet out links to my blog posts, and occasionally I’ll post a photo, but that’s it. I use it more as a resource than as a platform. “‘I was a member of the NASA Advisory Council on Planetary Defense which studied ways for NASA to defend the planet from asteroids and comets,’ Brian Wilcox, now at NASA’s Jet Propulsion Laboratory (JPL) at the California Institute of Technology, told BBC. That sounds more like personal opinion than NASA policy statement. It’s entirely possible that Mr. Wilcox’s pet project wasn’t getting enough attention, so he took it to the media. In any event, it’s going to be a cold day in the heart of the magma chamber before that kind of funding comes through. I do agree that we’ll get through this. How we’ll manage it is a different question, but I suspect every prediction made today will turn out to be wrong. Couldn’t agree more. You did know my tongue was in my cheek when I reported on his plan, right? I wasn’t sure, but it made me curious enough that I went off to see what in the world was being reported. These days, you can’t be too careful! I understand. And knowing how curious you are, I wouldn’t expect less. Quite timely … I am keeping to myself through it all, and praying for inner peace knowing it’s all according to Plan! There are different ways of coping with difficult times, and learning which way works for best for us can be an on-going project. Clearly, you’ve found your way, and it’s no mistake that you seem as strong and secure as many of your Sunday trees. How deep that poisoned pit seems. Yes, we can all use rather a lot of mercy now. Thank you for this post. You’re welcome, Anne. Understanding that mercy and grace always are available can be a great comfort, can’t it? Music can transcend the worst situations and ease the pain at least a little. I’ve always found that to be true. And there’s no predicting which music will do it. Sometimes it’s a piece like Gauthier’s, but there’s no predicting the genre. Even Dire Straits has helped me out of dire straits. What a nice, timely post, Linda. Thank you for searching and finding this peaceful song to accompany it. You know, as a former journalist (do we ever lose our “journalistic instincts”?? ), I feel the prevalence of media outlets and social media capitalize on the contentiousness and are doing an excellent job in feeding the frenzy. Are they helping or hurting things? ‘Tis not for me to say, but I obviously have an opinion! Reason tells me that we can tear down every statue ever constructed, burn every book ever written, demolish every plaque we disagree with, yet if we harbor hate in our hearts, we won’t accomplish a doggone thing. I’m a firm believer in knowledge. Those who refuse to study the past — with all its warts and mistakes — are more inclined to repeat the errors. Surely some discourse should have been undertaken before everybody opted to fly off the handle and into action. I’m with your friend — I, too, am plumb wore out! There’s no question that broadcast, print, and social media have contributed to our problems. A perfect example is an event that unfolded in Houston yesterday afternoon as the FBI, ATF, and other law enforcement agencies conducted a raid in a neighborhood just north of Rice University. Within the first hour, a breath-taking amount of misinformation was being spread (that the raid was on the Rice campus rather than in a neighborhood, for example) and the name-calling already had begun. In the absence of any real information, theories were being advanced as fact: that there was nerve gas being produced in the house, or that the Klan was responsible. The same dynamics were at play later last night when news of the USS John S. McCain’s collision hit the news. Some social media commenters began making snide remarks about Senator McCain (the ship actually is named after John S. McCain, Sr., and John S. McCain, Jr., both Admirals in the U.S. Navy and the grandfather and father of Senator McCain) while others proposed that everything from Chinese GPS tampering to ISIS infiltration were the cause. Even when it comes to statue removal, it can be useful to get the facts straight. There have been suggestions around here that the statue of that good ol’ supporter of the Confederacy, Sam Houston, ought to have his statues removed, too. Presumably, people making the suggestion have been through the school system and ought to have a better grip on the facts. Of course, the changing nature of our school systems may be partly responsible for their lack. As for what remains after the statues are gone, there was an author who pondered that issue. His name was Solzhenitsyn, and I’ll be having more to say about him later. As you can see, your comment got me going a bit — thanks! Thank you, Linda. I got out of journalism before it became commonplace to offer opinions rather than “just the facts, ma’am.” That was a good decision, I think! Perhaps we’ve become so enamored of celebrities and such that we put even TV anchors on a pedestal, granting them idol status. And you’re right — our education system isn’t what it was when I was in school. ‘Nuff said! Beautiful beautiful song. Thank you so much. Always love your posts. Be kind to one another and to all the creatures! Kindness is so important, and so easy — once we get the hang of it, at least. I often remember this song when I come across the word. It suggests the ability to extend kindness is less of an obligation and more of a gift. The proverb says, “A gentle answer turns away wrath, but a harsh word stirs up anger.” Perhaps more kind gestures could turn away some of today’s wrath, as well. I loved your answer to Jim above – I didn’t read that many comments, there are just too many! But I noticed that one, with the Yeats poem, etc. Yes. Good for you for creating a space where so many people are comfortable. And thank you for the introduction to Mary and a bit of calmness to the day. It occurs to me that her song is structured like many of your posts. It’s a collection of observations linked by a single thread, and like your posts, it’s very effective. Anyone who’s watched toddlers battling one another over a toy has seen how satisfying a bop over the head can be. But there comes a time to grow beyond that sort of behavior, and most of us do. Unfortunately, the temptation to revert to verbal whacks is ever-present: even for the most reasonable among us. Just taking a breath now and then can be a good defense against that sort of thing. It’s not unlike the bits of advice that were so common when I was growing up: count to ten before lashing out, and think before you speak. I always enjoy your work. Your thoughts are so lucid and intelligent. I agree with your thoughts. There is so much trauma and I feel futile to do anything but pray and hope. Thank you. Thank you so much. It means a lot to me that you appreciate what I try to do here, and most of all it makes me happy to hear you describe my thoughts as lucid. I’m never sure! There’s no way around it: thinking is hard work, especially when the issues are so complex. Even finding the words to express our thoughts can be hard, but in truth, words aren’t always needed. Simply being decent — even kind — to the people we encounter every day can make a big difference. I’m so pleased that I chose one of your favorites, Otto. A deeply honest song is just what a shallow and dishonest time needs — if only it will listen. Where we go from here I don’t know, but I do have a sense that things are shifting in some interesting ways. Wow. That is beautiful and a fine reminder of why we need art. Isn’t it a fine song? Leonard Cohen was right when he said that the light comes in through the cracks, and sometimes art is the crack that lets the light come in. Those are wise practices, Anne. They’re equally appropriate when it comes to dealing with weather. As our new storm, Harvey, approaches the Texas coast, the level of hype from the media isn’t really helpful. Rather than realistic assessments of what’s happening, their breathless suggestions that The Big One might be on our doorstep induces panic in some, and causes others to stop listening. In either case, it’s not helpful. Your reflection on the cycles of history is appropriate. We tend to assume that what is, has always been, and of course that isn’t so. Even when it comes to something like climate change, we tend to inflate our importance in the grand scheme of things. When I looked at the maps of the great sea that covered so much of our continent in the Cretaceous period, and watched its changes over millennia, it occurred to me with new directness that some planetary forces probably are beyond our control. Perhaps we do sense that reality, since the desire for control seems to be the primary motivating factor in many arenas today. This is a beautiful song, Linda, thank you for posting it. I wish more people would stop, sit still, and take a deep breath. There’s too much noise and not enough song, not enough beauty or thoughtfulness. I’m worn out with it all, too. I’m glad you found it appealing, Val. It seems to me that people who’ve never taken the time for silence and song find it more worthwhile than they’d imagined, once they’ve allowed themselves to stop. Beyond that, I’ve always found that when breathing becomes labored, a little rest can be helpful. Off topic, but important: are you and Dixie Rose bugging out with Harvey looming? I know the media hypes everything(Monday’s eclipse was a personal reminder), but the NHC is calling for 120 mph gusts and 15+ inches of rain, with Harvey stalling out over SE TX over the weekend. Not exactly a spring zephyr…..
All’s well here, Wiley. I’m staying put, since I looked things over and decided flooding was going to be our greatest threat. My place isn’t going to suffer from flooding or storm surge, and it’s sturdy enough that it made it through Ike with only a few missing shingles, so if the storm shows up here tomorrow or Monday as a Cat1 or 2, I’ll still be fine. As for Dixie Rose, she exhausted herself by prowling and howling for all Thursday, Thursday night, and yesterday. As soon as the real rain arrived, she went to sleep, and she’s still sleeping. I think all’s well. Linda, I came over to also speak to the hurricane – wishing you best of luck in getting through this big one. How kind of you to bring good wishes, Cirrelda — I appreciate it. I feel so badly for friends down the coast, one of whom lives just outside Rockport, and is going to have a terrible mess on his hands. I’m a little concerned about the various wildlife refuges and farmers, too. After seeing what Ike did, there’s going to be a lot of recovery needed there, too. We’ll just have to wait, and see how bad it is. But I’m fine, and expect to be. It’s entirely possible I’ll lose power at some point, and there’s always the threat of tornados, but there’s nothing to be done to prevent those things, so I’ll just carry on and see what happens. I hope all’s well in your world, both personally and artistically. Thank you for updating us, Linda. I have been thinking about you since Harvey was approaching the coast. I think my verb tense is off! On the other hand, he’s still thinking about approaching us, so the tense is appropriate for all of us tense ones up here. You are gracious….I should have been more so to my students. Keeping you in thought and prayers! Hope you are high enough to ride out Harvey’s mischief! I’m high and dry, Becca. That’s one reason I decided to stay put. I figured a third story apartment would be well out of the way of flooding. If it wasn’t, I always could run up to the fourth floor and bang on a door. We’re not out of it yet, but it’s good to see that the water outside has dropped by a foot this afternoon. It leaves some room for the rain we’re predicted to get tonight, and the few hours without rain have made it easier for those still trying to rescue people from their homes. Oh, thank heavens…… I’ve been glued to TWC all weekend and worried sick about you and The Queen. Sandi said she’d seen you check in here. I see you’re high and dry. Hope you still have power. I do have power. I also have fresh coffee, and a decent night’s sleep behind me now that Dixie’s decided she doesn’t have to spend her time yowling at me to do something about that nasty thunder and lightning, already. The water in the marina’s dropped a couple of feet overnight, which is a very good sign, indeed. I haven’t looked at reports yet, but it may mean that some of the creeks that feed the lake have at least stopped rising. I’ll touch base via email in a bit. Glad to see you have coffee and a happier cat. I heard, via Patti, that Emmy Rose is OK. Her house is not as high as your apartment, but is built on stilts. She is just frustrated she can’t get out. Hope it all settles down soon, so you can go and check on the boats! Emmy’s not the only one who’s a little frustrated she can’t get out. I did go for a walk this afternoon, but it’s still raining too hard to go far, and there’s too much flooding on the roadways to go anywhere. I’d thought about going down to a local Red Cross shelter to see if they needed some help, but I couldn’t get there today — at least, I wasn’t willing to drive through the water I found. Maybe tomorrow. Now, the water here is back up. We’re just a couple of hours from low tide, so it apparently is due to the rain we’ve had this afternoon. It’s still just pouring — but they say it may stop some day! Now Gué’s getting it. I told her that honest and truly we didn’t ship any of our excess that direction, but I’m not sure she believed me. While we haven’t ‘spoken’ in quite some time, you have no idea how often you have entered my thoughts these past few days. I read on The Ark on Sandi’s page that you were faring ok. What a time you must be having. I’m glad to also read that Emmy is doing ok as well. I have a nephew in Corpus Christi that evacuated his family to San Antonio last week. I don’t honestly know if they are home yet. Now that I have found you again (no easy task….had to rack my brain what ‘names you used ‘), I’ll try to fit in time to do more reading of your writing, which I have always enjoyed. Just a quick update on me. Retired (starting year 3), grandma two more times, a boy and girl (up and done to 4), and busier retired than when I was working. Please keep posting about how you are doing so we can all know! It’s delightful to have you visit, Karen. It’s hard to believe its been three years since your retirement, but it’s easy to believe you’re even busier now. I did see some photos from Corpus and Rockport this morning. The damage is ranges from substantial to devastating, of course, but the sun was shining as brightly as could be. It’s funny how cheering it was just to see photos of the sunlight. One of these days, we’ll see it for ourselves. I need to begin posting some at the Ark, too. What an appropriate site name! I’m a member there, but it’s been harder than I realized it would be even to touch base there from time to time. This would be a good time to start. I’ll be posting some photos here later today, so you can see some of my “delights” from this event. As with Katrina, updates are difficult to find – as there is a lot of old information that gets in the way of the newest – and seeing via a mini laptop does not give a clear picture of what’s going on…. It looks like Houston is a big lake…. Of course I’m wondering with the rest the concerned, what’s Harvey going to do – but for sure he’ll inch northeast – and hopefully most people are preparing for the worst but hoping for the best. Suffice to know that I am thinking of you and everyone affected by this bad-tempered storm. We’re beginning the transition from a rain event to a river-flooding event. Levees are beginning to breech, and the reservoirs are overtopping. The levee at Columbia Lakes in Brazoria County just has breeched, and another friend will no doubt have water in her house, if she doesn’t already. In a nearby town (Friendswood) where my mother used to go for her knitting club, and where I arranged her funeral, the record for total rainfall from a tropical system has been broken. Mary’s Creek at Winding Road recorded 49.20″. The previous U.S. record is 48″ — ironically, from Medina, Texas, which is one of my favorite hill country destinations. The good news for us is that the rain is lessening, and the winds have shifted to the north. The system’s on the move, although we’re going to have feeder bands for a while yet, and periods of heavy rain. Stores and restaurants are opening in some cases, and at least people in their neighborhoods can get to them. After Ike, many bridges and roadbeds were raised. It will be interesting to see how they fared this time. It is so great to get a good update; i saw last night where the levees were barely peeking above the floodwaters…I hope that Harvey gets busy and scampers on out of y\our area… it’s time you all get a break and start the attempts of reclaiming a normal life again. The process has started already. The George R. Brown convention center already has 10,000 people housed, and Toyota Center will take some of the overflow. The NRG Center will open tonight, with room for 10,000 more — there is a dining facility, a children’s center, pharmacy and medical center, etc. Smaller towns have smaller acommodations, but things are working. A lot of fund-raising is being done, too. One of the most interesting is the fund started by the Houston Texans’ football player, JJWatt. He had hoped to raise a million, I think, but the fund is just short of five million now — and all of it going directly to relief, with no administrative costs. We’ll get through it. It’s always heart warming to witness people pulling together, joining forces, and supporting one another during challenging times. the five-million mark is amazing – wow…. As I ‘watched’ via snippets on the internet, and the rain kept falling, I thought of the opening story in Barry’s Rising Tide. Books will be written about this one as well. I hope that the sun soon shines on all of you… When you see or talk to them, give all of the ‘Birding Ladies’ my love. Hehehehe…. You know me better than that! I’ve been a storm watcher for too long to not know the diff between Harvey’s rain and a local TD’s rain. There are folks here in the office that have asked me how we were getting rain “all the way from TX?” Oh, boy. BTW, when did they start calling a TD a ‘Potential Tropical Cyclone.’ Did someone in the NHC decide that ‘tropical depression’ just didn’t have enough cachét or wasn’t attention grabbing enough? It may seem like bureaucratic tweaking to people who know the GFS and ECMWF better than the menu at their favorite restaurant, but I can see the value as far as public notification’s concerned. Just checking in to say I’m glad you and Dixie Rose are ok – and I’m so sorry for the chaos Mama Nature has unleashed on your beloved Texas. This post is excellent, by the way. It reminds me of how much I enjoyed blogging, which is like saying how much I miss paddling the Jordan River and hiking at Pictured Rocks. No joy without effort, eh? Wonderful to see you, Gerry. It’s amazing what floats in on a good flood! I think about you often, and hope all’s well with you. It’s been remarkable, this storm. It makes sense that the news folks are focusing on urban flooding and rescues, but once this is over, the damage to the farmers and ranchers is going to begin to reveal itself. Cotton doesn’t do too well with feet of rain just before harvest, and there are herds of cattle roaming free, searching for higher ground. Sometimes, it’s better not to think about the actual scope of things, and just keep doing what needs to be done. Don’t wait for the next disaster before you stop by again! It’s good to see the former WUers are still keeping in touch! Glad that you and Dixie are faring well, too. So far, so good — at least for us. It’s just beyond words for so many others. I do see one seagull out sweeping around over the waves. Maybe I should check and see if it has an olive branch in its beak. You’re right about the long term effect on farmers and ranchers. Everyone and everything else, too, for that matter. It amazes me just how many people think that once a storm has moved on, everything will go right back to normal and then get mad and look for someone to blame when it doesn’t. Even some of the ones that have been through this kind of thing before. It can take years. One foot in front of the other. You do what you can, one thing at a time. Hubby and I were lucky with Hugo but I felt twinges of guilt afterwards because we escaped major damage and so many others lost everything.. Remember Varnish John? “You start where you can start, and do what you can do.” Amen, brother. Yes, Amen, and yes we could all use a little mercy now. Thank you for this lovely reminder. You’re welcome. What’s ironic is that I first came across this song after Hurricane Katrina. It works for Harvey as well as for political storms. Good morning Linda – just came by to sit with you a bit and listen to Mary Gauthier again. Here – I brought you a litle jar of tart cherry preserves. Glad to see you’re still attached to the outside world. How are you doing? And how are the neighbors? Keep well. May mercy be the only thing that rains down upon you for awhile now. And good evening to you, Gerry. My gracious — what could be better than tart cherry preserves? Well, except your visit, of course. All is well for me, although many are suffering greatly. In fact, some still are being rescued by boat, and it’s going to be a long, tough slog until the rivers go down. That isn’t going to be in one week, or two. Who knows how long it will be at this point? I have a full tank of gas, some fresh groceries, and went off to work today. I laughed at the amount of sand that was covering the docks at the marina. Honestly, I don’t know where the sand came from. The only thing I can imagine is that it blew in from Galveston — and now that I say that, it makes no sense, since our winds were from the northwest rather than the south at the end of it all. I’ll make some inquiries tomorrow. Perhaps someone stayed on their boat through it all and will know. Now that I have a new post up with some pics, you can get a little sense of what it was like. For once it my life, I had the experience of living at a lake — albeit one without those nice stones. I’m working all weekend, since the fellow who owns the boat isn’t about to take it out with so much debris in the water. I don’t mind. It’s enough to see blue sky and sunshine. This is all good news. I’ve been watching water and wind move sand on the bay for a long time – and I see the evidence of the same forces at work for a much longer time, all around me. Sometimes I can tell that the waves themselves are full of sand they’ve scoured from somewhere else. As to where, that remains a mystery. May no sand blow about as you varnish. Now I can go read the new post. Thank you for the introduction to Mary Gauthier. I loved the song and found more. I read this post when it came out, and couldn’t comment then, but did want to thank you. You’re welcome, Shimon. I was introduced to the song after Hurricane Katrina. Someone had made a video with images from Katrina and Mary’s song. It was quite powerful, and the song’s stayed in mind since. It does, of course, apply in many situations, and continues to apply today.